Cross offers custom engraving on most of our products. Our in-house, skilled engravers use state-of-the-art equipment and work to the most exacting standards for unmatched engraving quality. 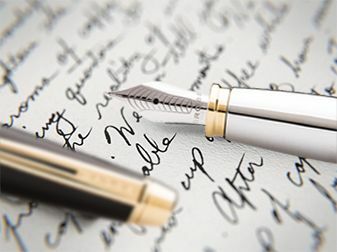 The end result is a personalized writing instrument, watch or accessory of the highest quality that is unparalleled in craftsmanship or attention to detail. When you opt for decoration, you create a truly one-of-a-kind piece for yourself, a friend or a loved one. A choice of engraving styles is available for most products, including block, script, euro and contempo. Our expert engraving services are available for a vast majority of our pens and pencils. Names or messages are limited in character length and placement. Engraving styles include block, script, euro, and contempo. Create a gift that will be cherished for a lifetime. Cross offers custom engraving on our men’s and women’s watches. Engraving will be placed on the back of the stainless steel case. Engraving styles include block, script, euro, and contempo. Personalize one of our beautiful leather accessories. Most pieces can be imprinted up to three characters in block letters. Note: Engraving services are available for select pens, watches and accessories only. The choice of available engraving styles, number of engraving lines, and maximum number of characters per line varies from product to product. We do not accept returns on any engraved items for refunds or merchandise exchanges. We will accept customized items for repair under our warranty policy as described in the warranty section of the site. Gift wrapping is available for a majority of products purchased on Cross.com. If requested, your gift will arrive with our silver gift wrap and our seasonal ribbon. To add the perfect finishing touch, we also offer a personalized gift card, hand-written with your message to the recipient. If you would prefer to write your own note, simply request a blank gift card with your purchase.